Parachute Regiment, Pegasus / Union Jack morale patches, velcro backed. Pegasus. 16 Air Assault Brigade [Airborne] latest issue TRF + morale patches. The design depicts 'Bellerophon' the first Airborne Warrior, astride the winged horse 'Pegasus'. This beloved emblem of British Airborne Forces dates from their formation in 1940. Small size UK Airborne forces 'Pegasus' patch in black on olive green. British Pegasus Patches. Featuring the Ancient Greek Hero Bellerophon, upon the winged horse Pegasus. This symbol continues to be the symbol of paratroopers within the British Army. A left and right arm pair of patches in the WW2 style, featuring light blue stitching on a maroon wool backing. 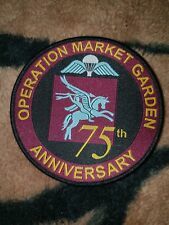 AS SHOWN IN PICTURES, WW.2 PRINTED AIRBORNE PARATROOPER PEGASUS PATCH. A GOOD OUTLINE AND 2. HOLES CAN BE SEEN ON THE BERET WHERE THE BADGE HAS BEEN. Pegasus Badge, Patch, Airborne DZ Flash, Army, Military. Patch can be Sew on. 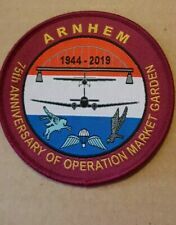 75th Arnhem anniversary patch. Airborne Forces Arnhem. Para wings Pegasus. Parachute Reg. Lay your cloth on a flat, heat-resistant surface like an ironing board. Remove the iron and allow the patch to to cool. Lift the towel and check to see whether the patch is fixed on securely by gently rubbing at the edge with a finger, trying to lift it. They're identical to the issue types, in that they are printed on 100 % cotton. The set are uncut and new--to put them in a display or on a uniform you cut them apart, fold the edges along the dashed lines, and sew them down.just like you had to do with the originals! This is an iron-on/sew-on cloth patch whose size is 7 cm by 5.5 cm. Sew Embroidery Iron On Patch Badge Clothes Fabric Applique. Sew Iron On Patch Badge Bag Clothes Fabric Applique. Top Quality Sew on and Iron on Patches. Step 2: Place your applique or embroidered patch in the desired position and place a pressing cloth (such as a handkerchief, sheet or pillowcase fabric) over top. High Quality Vibrant Embroidered Pegasus Wings Horse Iron on Sew on Patch. Can be sew. Iron may scorch leathers and suede's. presented to you inside a sealed clear cello bag, with basic instructions.